A plank and batten door is a door that is made of vertical panels of wood on the weather side (the side that faces the outside of the house) and held together by battens. Battens can be placed across the tops and bottoms of the planks, though sometimes diagonal or Z-shaped supports are added to shore up the door's structure and prevent skewing. There is usually no way to know the arrangement of battens by looking at the plank side of the door. These planks have been recently painted with pink enamel. 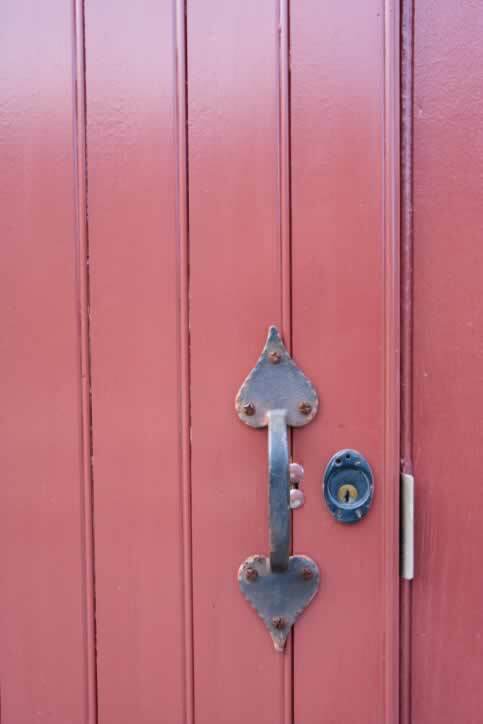 The handle is affixed to the door by just six screws, three through each heart-shaped plate. However, the painter did not take the time to remove the wrought iron door handle. Original hardware should always be removed for painting. Because of the finish on this hardware, restoration is likely. The same can be said for the lovely escutcheon that surrounds the lock cylinder.